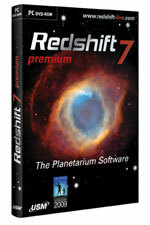 The Planetarium software which leaves nothing to wish for! Download daily updates of new discoveries and orbital data of satellites, comets and asteroids. Calculates the position and simulates the movement of some 100,000,000 stars, more than 1,000,000 deep space objects including nebulae, galaxies and quasars, over 150,000 asteroids, 100+ planetary moons and some 2,000 comets. Improved Sky Diary - the calendar includes additional celestial events in the monthly overview and a new planet/eclipses observation mode (special guided tours animating the events). Revised high resolution maps of planets obtained from the latest space missions. Online interaction of RedShift with GoogleTM Earth map. In this way you precisely can set you home location in RedShift. Observation planner allowing you to refine your observation schedule for tonight. Travel through time to observe the skies from any vantage point on Earth or in our solar system from 4173 BC to 9999 AD. Access a spectacular photo gallery of hundreds high-resolution color images, featuring famous celestial bodies. Video gallery with over 50 real movies and animations devoted to space and astronomy - including Apollo 13 and the Hubble Space Telescope. 12 lectures - excursions through deep space.